Sleek, simple, and inexpensive. The perfect fit if you are just getting started. If you’re looking for high-quality pedals, you should most definitely check TC Electronic’s catalog out. They boast a huge assortment of excellent pedals and processors, including TC2290 DT Delay, the Brainwaves Pitch Shifter, Poly Tune tuner pedal, Flashback and Flashback 2, Hall of Fame, and a plethora of others. We’ve just mentioned their flagship models, but since we’re more interested in affordability here, we’re recommending that you check out their ‘Ditto’ loop pedal. In short, Ditto is a very simple, old-fashioned loop pedal that boasts a humble outfit of settings and controls. It’s incredibly easy to use, so it’s best used by beginner guitarists who have just ventured out to explore the vast world of guitar pedal effects. Like we’ve just mentioned, it has but a small number of features – you’ll get five minutes of total loop time, a hard aluminum casing, and the one thing that most live performers look for – one-touch operation. TC Electronic’s Ditto is very small in size. In fact, it shares almost identical dimensions to most regular-sized looper pedals. It packs 24-bit uncompressed audio performance, a miniature footprint and is USB compliant. Apart from being small, Ditto packs quite a punch with 5 minutes worth of looping, classic undo and redo functions, unlimited number of redubs, and a single volume adjustment control knob. Overall the simple features and reliable performance is what makes this little looper pedal so good. Most people who have used it will tell you the same – the plug ‘n play mode of operation is what’s best about it if you’re a gigging musician. The 5 minutes of total loop time might not be much in this scenario, though, but it’s precisely this that makes it so good for studio work, especially given that you’ll have unlimited overdubs. Most people point out that another great thing about it is the Hi-Fi quality of audio. Namely, several layers of loops atop your sound won’t sound too digital or non-organic, but you shouldn’t overdo it unless that’s precisely what you wanted to get in the first place. If you’re feeling up for it, you can check out the improved versions of Ditto – the ‘Ditto X2’ and Ditto X4’, both of which come with a relatively similar design and features, but note that they cost nearly twice as much. If you’re low on budget, the plain old Ditto should do just fine – the same technologies were used to make all of these versions after all. 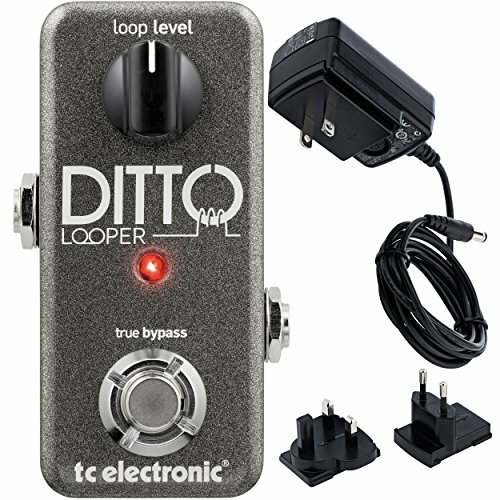 Though not the most versatile loop pedal you’ll ever find, Ditto is certainly among the best loopers under $100. It does a major bang for the buck, sounds very good for the money, and it’s remarkably easy to use it. Certain people say that they’ve had some problems with the adapter that comes with it, but that’s pretty much the only downside you should be expecting.